Fig. 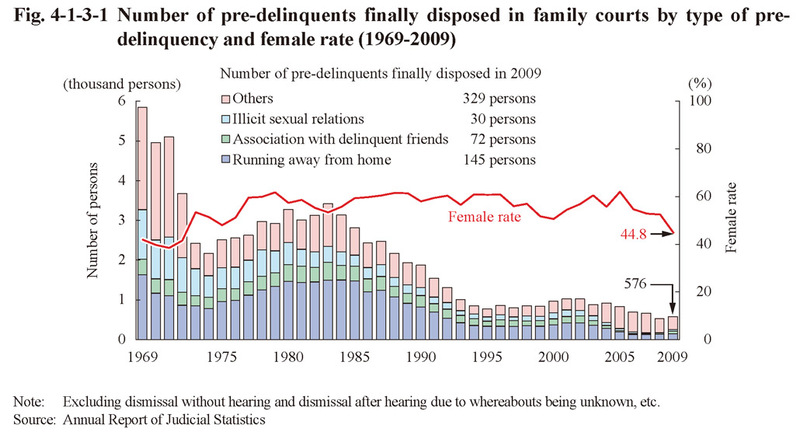 4-1-3-1 shows the number of pre-delinquents finally disposed in family courts and the female rate by type of pre-delinquency since 1969 (See Appendix 4-7). The number of pre-delinquents finally disposed had generally been on a decreasing trend since 1984 but did slightly increase from the previous year in 2009 to 576 (up 6.3% from the previous year). The female rate had remained within the range of 50 to 65% from 1976 but was then 44.8% in 2009 (down 7.6 points (id. )).